Among the mammal fossils that have been discovered in the tar pits are those of mastodons, giant bisons, American camels, stilt-legged llamas, dire wolves, short-faced bears, ground sloths and many more herbivores and carnivores. Even fossils of extinct and extant birds have been found in the tar pits. Among these are the teratornis, La Brea stork, and California condor. Fish, amphibians and reptiles as well as arthropods have also been trapped in the pits. Of equal importance to paleontologists are the fossils of plants like the California Sycamore, Ragweed and Coast live oak that have been found in the tar pits. To showcase the discoveries of the La Brea Tar Pits, the George C. Page Museum was erected next to the tar pits as part of the Natural History Museum of Los Angeles County. 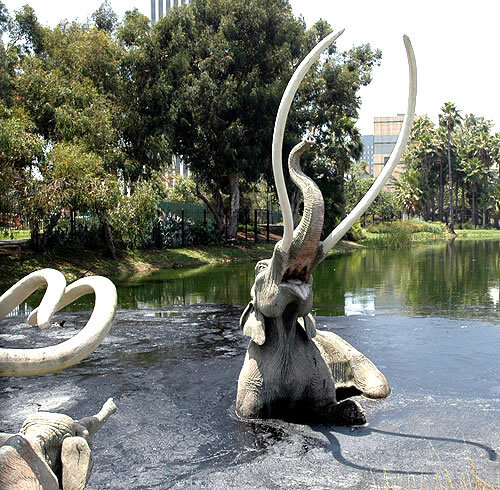 Its dramatic exhibits present the history of the tar pits and show the specimens retrieved from them. The Museum has over 1 million fossils from the Ice Age with shows using puppets and marionettes that bring the prehistoric animals to life. There’s also the Pleistocene Garden that recreates the landscape of the La Brea plant fossils 40,000 years ago. Of special interest to the Museum’s visitors is the Fishbowl Lab. An honest-to-goodness paleontology laboratory, guests can watch scientists clean, study and prepare fossils for exhibition. Many of these are from excavation work that goes on at the tar pits every day.